Most were aged in their 20s, or were 55-plus, including both couples or singles, the majority women. A few had children. Most of the people I interviewed were in southeast Queensland, but some were in Victoria and Tasmania. The majority were situated in rural or semi-rural areas, although a couple lived in suburban locations (Brisbane and Logan). Nearly all had built their own tiny house, but some had bought their homes from tiny house builders. Interestingly, few homes were the archetypal tiny house on wheels—there were container houses, converted buses, and even tents. I love it. Love living in it; independent side of things… It’s much better than (living in) the caravan—own shower, kitchen, composting toilet, complete independence. I don’t like the fact that there is no surety that I can stay legally in one place. I don’t like knowing that I can’t stay long-term. You know what your timeframe is for renting, (you’re) not going to be moved for a ridiculous reason. There’s no protection if in a tiny house. Silly (council) rules like I (have to) stay in it for two nights, then move into the main house for one night, I get why these things have been put into place…waste and water, amenity; but I don’t see why (regulations) for that can’t be implemented. Local governments, in particular, could be far more proactive by adapting their planning schemes to permit more flexible types of dwellings, obviously in accordance with building, health, safety and environmental regulations. This would enable people to live in security without being afraid that they are going to be moved off because some neighbour might complain. As long as safe and sanitary, and not an environmental eyesore, then why not? 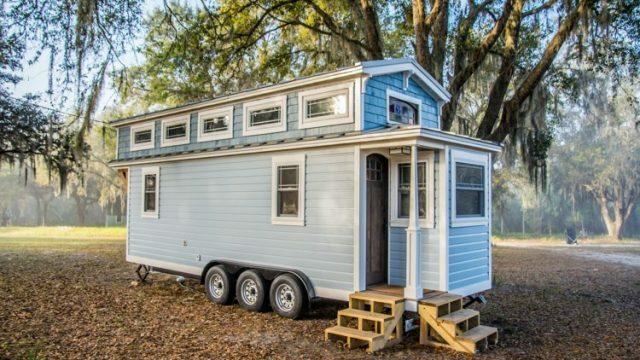 It’s very easy to say, if you have a certain size property, then you can have x tiny houses, (at a) certain distance. Heather Shearer has a PhD, which investigatrf household response to water demand policy; a Masters in Environmental Management and BA (Hons) in Environmental Science. She is currently researching various aspects of urban sustainability, including housing affordability, water and energy use, environmental behaviour and attitudes to climate change.